The slowing down of nature reminds me that this year will soon be over. Did I do everything I committed to do this year? There is only little time left, but I still can make a difference if I focus on it now. A holiday with friends and family. Time to appreciate good company and conversations, maybe share some of the reflections, see what everyone’s plans are for the holidays and New Year. No family here and no way to visit them? Technology is rapidly solving the problem with laptops and tablets with video cameras and free internet calling, around the globe, and even with conference sessions. Get everyone set up with the technology, put on a smile and call. Ever had a video dinner? Invite them over, virtually, to your table, and make a toast. And time to think about “thanking”. My immediate thanks are these: By the time you will read this, our Fall Reunion will have completed. 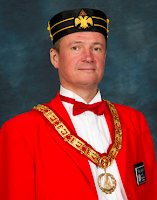 The 18th Degree, Knight Rose Croix was once again a very impressive performance. Many thanks to the degree team, specifically to the new members and those that temporarily stepped in to fill gaps caused by schedule conflicts. I also would like to thank my line of officers for their support this year, it has been smooth so far. Last but not least, a brief reminder about our next wine tasting event: Our next Passport Day will be on November 15th and we are looking at the Saratoga wineries, specifically Savannah-Chanelle, Cinnabar and Cooper-Garrod. Please call me at (408) 505-1822 in case of questions, and see http://scmwa.com/event/passport-4/ for general information about the passport events.